But it was a combination model (or so I always thought) and getting my parents to buy me several sets was not going to happen so a dream it remained. But it has always remained a dream. So when I saw http://shop.lego.com/en-SE/Mobile-Crane-MK-II-42009 it was not without a hint of childhood dreams rushing back at me. Now this is a massive set and it is pretty expensive so I cannot really just buy it (my girlfriend would kill me). This took me about "a day" some of it spent having my kids build it some of it spend rebuilding what my kids built and some of it spent rebuild when I tried to fix the skipping linear actuators. It is a rather epic model. The size is daunting it is huge: I mean really huge. But it is not without flaws. The gear box is without par and really really amazing, I fondly remember the http://brickset.com/sets/8860-1 which had a functioning gearbox where you could change between 3 gears. This has a gearbox controls 6 different functions in different pars with of the crane, all from a single motor: it is truly epic. It has some issues though the biggest one is the use of linear actuators: I don't mind them from a technical perspective but instead the lack of a friction gear. When you run the crane down or up the edge position a heart tearing screech is heard when the linear actuators starts to skid. I would have prefered a friction gear instead. It is also a shame the placed the steering wheel behind. Quite frankly I cant understand it, it might make it simpler to drive the model but it makes it far less real. Lastly the lack of motorized forwards propulsion seems a bit of a let down and I understand that you cant do everything but it would have pretty cool if they at least had an engine option for the mode to make it fully motorized. Heading for the B-side I spent a good solid 2 hours tearing the model up. It was quite a job and actually gave me blisters. A good thing I had Sophia helping me with sorting the Legos. This time I opted for not sorting studs by colour as it was a rather retarded way to sort them. Instead I sorted studs by length and a lot of the pieces by size and then colour. Mainly as small pieces fall to the bottom. All in all the B set was pretty cool and looked like it could have been an A-set to be honest. I really enjoyed the build as well as the resulting model. 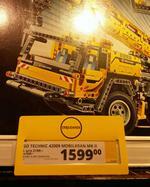 It was really interesting to revisit Lego Technics as an adult mainly just to see the development. When I was a kid Lego Technics had a number of patters for building models and they repeated over and over in all sets. One example the way you locked pieces together. The way this worked back in the 1980:s was that you added two thin layers between tho beams to fit the distance between holes horizintaly to allow a third beam to lock the two beams together. But alas this is no more! There were a lot of others as well which seem to be all long gone instead a whole range of new Technics has replaced them. So through out the build I kept thinking how "back in the days this would have been ... instead". In all honesty I have to say I like Lego Technics of the 2010:s much much better then the Lego Technics of the 1980:s. But some of the changes seems odd for instance there is a lot of connecting small axles to build longer ones and such which seems like an attempt to increase the number of pieces. Indeed it is, and it was well worth it. Just the gear box would have been worth it as it was amazingly cool. I could still not quite figure out how the gears all work out when I built the b-models gearbox until the end. And I cant help but dream of my next epic Lego model... question is: Will it be http://shop.lego.com/en-SE/The-SHIELD-Helicarrier-76042 or yet another epic Technics set?